You don’t even have the decency to die! 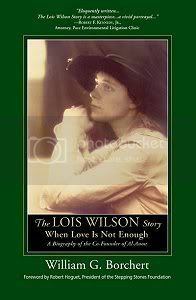 A man named William Borchert has written a book titled “The Lois Wilson Story–When Love is not enough” that has been made into a movie. The movie will premier on the “Hallmark Hall of Fame” on the CBS network April 25th,2010 at 9:00 PM EST, and stars Winona Ryder as Lois Wilson, the founder of Al-Anon, and Barry Pepper as her husband Bill Wilson, one of the co-founders of Alcoholics Anonymous. This woman was one of the most important and influential people of the twentieth century. Without her, there would have been no Alcoholics Anonymous or Al-Anon Family Groups, and millions of people that have used these programs to recover from a seemingly hopeless state of mind and body, would still be suffering. I suggest you put it on your calendar and invite some friends over to watch it with you. Whether you are in Recovery or not, you will be amazed how the faith of this woman changed the world. Here are some things other people have to say about Lois Wilson, Mr. Borcherts book, and the movie. Enjoy. Near the bottom of her husband Bill’s downward spiral into alcoholic hell, when he collapsed one night in a drunken stupor in the hallway of their Clinton Street, Brooklyn home, Lois Wilson felt she could bear no more. Pounding hysterically on his chest, she screamed out in despair: “You don’t even have the decency to die!” The compelling story behind this painful, oft-repeated scene eventually led to two of the most important movements of the twentieth century: Alcohol Anonymous and Al-Anon. Lois Wilson, the wife of the man who co-founded Alcoholics Anonymous (AA), stuck by her husband through his seventeen years of tormented and abusive alcoholic drinking, believing that her unconditional love could get him sober. But it could not. The daughter of well-to-do parents, this loving and determined women watched her husband, Bill Wilson, destroy his career, his relationships and his health, checking into and out of alcoholic sanatoriums as he neared the point of insanity and death. Finally, through a life-changing spiritual experience, the fellowship of AA was born. It was through Lois Wilson’s heart-rending, emotional struggle and her witnessing other spouses and children similarly impacted that she came to realize that alcoholism is a family disease and that the solution was a program for recovery, a family support group that came to be known as Al-Anon.